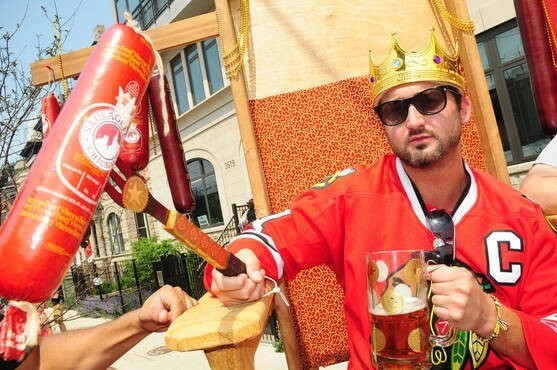 At SausageFest 2012, which happens this weekend, June 2 and 3, a new Sausage King will be crowned. I had some questions for the reigning Sausage King, Nick Pobutsky. How does one become the Sausage King? The concept of Sausage King of Chicago was derived from past hit movies (we all know the one!) and just seems to be a humorous play on words. 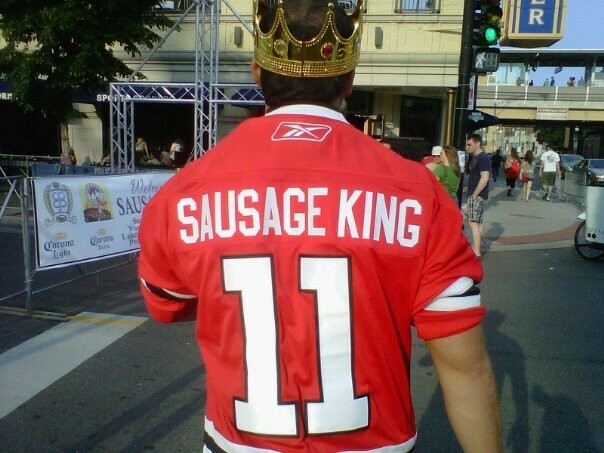 I’m not entirely sure if there ever really was a real Sausage King for Chi-Town . . . but there sure is now! The creators of SausageFest (greencurtainevents.com) thought of an ideal gimmick to promote the event while reminding the public that charity for the Prostate Cancer Foundation is involved. The Sausage King seems to serve as a mascot or Mickey Mouse-type icon (which is great for photo opps). And throughout the year the Sausage King (in my eyes) serves as an ambassador for men’s overall wellness and prostate cancer awareness. To take the "title," deserving candidates register online at sausagekingchicago.com and create a profile. Then the campaigning begins for donations and public support. And it really does become a fun competition. I was lucky enough to win by only $86 in 2011 . . . so every dollar from my friends and family really did count. What are the perks? Do you get all the sausage you can eat? Perks are to sit on the throne and baste in the sun all weekend long in one of Chicago's best neighborhoods: Wrigleyville. 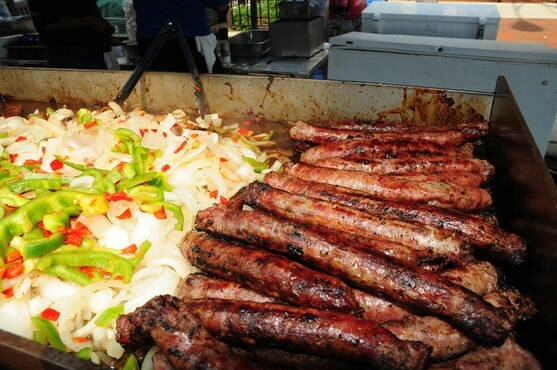 You must eat a considerable amount of sausage options, drink cold beer, take pictures with all types of fans, and have the best seat in the house for some tier-one bands, DJs, and entertainment. How do you feel about giving up the crown? Any 2012 contestants you'd consider the front-runner to be your successor? I am fair game for giving up my title, absolutely. It has been nothing but good to me, and I want others to feel the gratitude that I have felt. I did lose a grandfather to prostate cancer, and my mother is a breast cancer survivor, so personal reasons are attached. However, the best feeling of all was having friends and family flock around you and support! Whether it was donations online from family members out-of-state, friends attending one of my fund-raisers, or the many who showed at the fest to see me crowned—all were amazing boosts of encouragement. It made the hard work well worth it. We all have so many stories that affect us like this, so it shouldn’t be a title that stays with just one person. I’ll be honored however to step up and fill in for a new King if needed. Currently there are eight deserving candidates running online for the new crown, and "Once a King, Always a King." So it is becoming more like a fraternity of sorts and an honor to be a part of in our city. The front-runners for a tight race are Todd Angevine, Rob Mowry, and Shane Sierzega. Shane was the first candidate to register and has been promoting for the cause ever since. Todd has been the steady horse in the race (hosting several social gatherings and fund-raisers over the past month while keeping the concept of "fun" as the backbone for his campaign . . . heck, even "partying" can help benefit great things after all. Rob was a latecomer, yet very involved for many personal reasons. He is relying on the strength of his networks to gain support. And the "wild card" to watch out for is Brian Tomkins, a local philanthropist and tireless worker. He really could turn some heads going into the final day before the new Sausage King is awarded. Any closing thoughts, sausage-related or not? Come out to the fest! Enjoy this great city for all it's worth, as this Sausage King competition is just one layer to the overall entertainment. If you can't make it, consider donating anything you can spare for one of the new guys. Because they are stepping up and putting themselves out there! We’re all family men, career driven, like to have fun, and have different reasons for signing up for this cause. We are all very busy and committed like others in Chicago, yet still trying to make a small difference.